State Senator Scott Bennett says he feels he has hit the ground running since being appointed 10 months ago. He officially launched his bid Wednesday to retain his seat in next year’s election. Addressing a crowd at the Vermilion County Democratic Party Headquarters in Danville, Senator Bennett noted there has been an erosion of manufacturing jobs over the years. But recently, Bennett says that trend has changed. ‘’You know certainly the last half of the Twentieth Century Vermilion County, and actually the whole Midwest, took some big hits in manufacturing jobs. But over the last decade what we’ve seen is that unemployment has dropped down – manufacturing jobs has gone up. 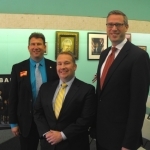 And that’s because of a lot of hard work by our leaders – both in business and in government here in Danville and Vermilion County,’’ says Senator Bennett. Danville Mayor Scott Eisenhauer says Bennett was in his office within three hours of when he was appointed as the new 52nd District Senator in January. Bennett wanted to know how he could help Danville and Vermilion County. ”He’s in this county all the time,” added Mayor Eisenhauer, who added they do not always agree on the issues. And Bennett added he wants to continue the efforts to bring more opportunities to our area. The Senator also pledged he will continue to fight for higher education funding.